Hello everyone, this week I wore OPI The One That Got Away. I love the berry pink color and the shimmery finish, but I got bored of it already the next day, so I added a coat of Blue Shatter for a quick metamorphosis. It's not the best combination, but at least it was different, haha. It's the second time that I used Blue Shatter and I absolutely love it. It's so bright and has a shimmery glow when it's matte. Gosh, I wish there was a regular, non-shattering version of it! In the pictures, however, I also used a topcoat, which made everything shiny again, to minimalize the difference in finishes of the polishes. It was a bit too much for my taste :) See you soon! I get bored of plain colors quickly too. I wish I could do as many beautiful designs as you! It looks so cute! That is a beautiful color! I think it's a fine combination! 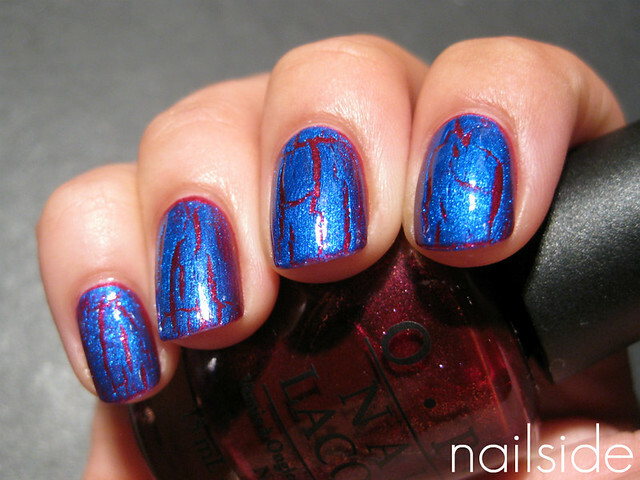 Would Orly Sweet Peacock fill the need for a glow non-crack blue in your life? what care you use for your cuticles? This is a really great combination. I need to get a colored shatter, I only have silver and black. The blue shatters look awesome. @KarenD: Thanks! And I have Orly Sweet Peacock! Just bought it. I really love it, though it's too different from Blue Shatter, haha. The finish is more foil-like rather than a metallic shimmer like the OPI. @Miss Starshiny: To push back my cuticles I use Orly's Cutique, it works but I'd like to try something more efficient when my bottle's empty. To moisterize them I use Lush Lemony Flutter and a bodycream from Vichy: NutriExtra. It's my holy grail!! We sure have the same taste....I had this exact combo on this afternoon!